Meeting Iranians : Bring me to your leader! 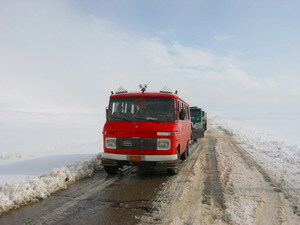 IRAN : in 2003, I was traveling the country and on the way north to the remote Takh-e-soleiman in snowed-in country and had to change transport in small towns. As I got off the bus in one of them, a dozen Iranians gathered around me, puzzled to see this midget-sized Asian visitor. I took out my camera and shot this clips.